No eggs. No dairy. But it works! Once these waffles are topped with a little maple syrup, you can hardly tell the difference between these and waffles made with eggs and milk. The recipe was sent to us by a user named 'checkers' a few years ago and has gotten plenty of rave reviews since then. I tried it this morning (June 2013) and I agree with the positive comments. The only changes I made to the recipe as submitted were to add 2 more Tablespoons of all-purpose flour (to get the batter constancy I'm used to) and to add 1 teaspoon of vanilla for a tad bit more flavor. Sift dry ingredients together in a medium bowl. Make a little hole in the middle of this mixture and pour in water then oil. Stir just until wet. 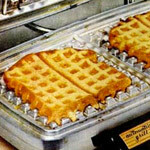 Cook in waffle iron at preferred setting. Serve with butter/margarine and syrup. One word of caution: 2 Tablespoons of oil is the bare minimum that you should use in this recipe. It worked for me, but I used a very new waffle maker. 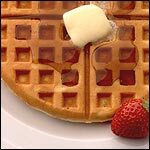 If I was using an older model or one where waffles have a tendency to stick, I would definitely increase the oil to 3 Tablespoons. I would suggest that you increase your normal cooking time just a notch as the waffles are slightly less crispy than than those with egg cooked at the same setting. This recipe made exactly four 6 and 1/2-inch waffles. If you add a 1/4 cup more water, this works as a good pancake batter. 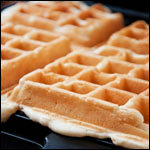 What do you think of Egg-Free Waffles? View all 60 comments for this recipe. It was really tasty and smells supper nice. Enjoyed them. Didn't miss the egg. The best waffle I've ever made without the eggs and milk. I used all-purpose flour and add in cinnamon and vanilla extract. I tried it right when its done and it came out fluffy, crunchy on the outside yummy! Turned out great. Really good recipe. Easy too. My husband and I gave up milk and eggs 6 months ago. 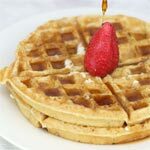 Since that time, we have tried at least a dozen recipes for waffles using different types of substitutions. We can finally stop searching because we both agree on this one. And it is very easy to make. Thanks for sharing. It was good. Way better than the recipes that use egg. Mine came out thick and packed, but over all it's a good recipe. Maybe I should add more water next time. I just flew in from a vacation and needed a recipe with "normal" stuff since my fridge is empty and thanks to jet-lag I woke up at 5 am. This recipe fits perfectly! I love the texture but I would suggest adding more flavor to it since it's pretty bland... I added cinnamon, vanilla extract and chocolate chips. This is great! 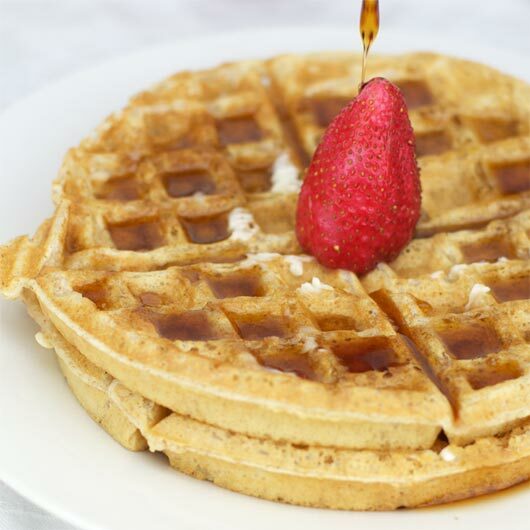 This is the best waffle recipe I have ever tried! My kids are so picky, so I know it's a great recipe. I did substitute the water for almond milk and put in some vanilla just to give it a little bit of a sweeter taste. Crispy and yummy! But I am wondering if there is a way I could incorporate eggs while still leaving out the milk? Batter stuck way more than waffles we've made with egg in the batter. Think it needs more oil in the recipe. I just made it and my sister and I are really excited! It's really light and suitable for people with high cholesterol. They were pretty good for egg-less option. Just not fluffy enough obviously. I made them on the Cuisinart Breakfast Central waffle maker. They came out nice golden brown and crisp on its maximum setting. Since we prefer egg-less, I would definitely use this recipe. 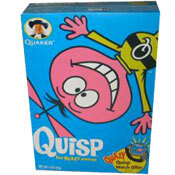 These were good. I substituted the wheat flour with toasted wheat germ. Also added a tablespoon of cinnamon and used olive oil instead of canola. Need to add butter and vanilla next time. Maybe I did something wrong since a lot of these people seem to like it, but no there's comparison with regular waffles in my opinion. Great recipe. Used regular flour instead of wheat flower. Worked perfectly. They weren't as fluffy as ones that you make with egg, but they were pretty good. I used vanilla vegan protein drink instead of water. It added more calories, but I need to be on a higher protein diet. 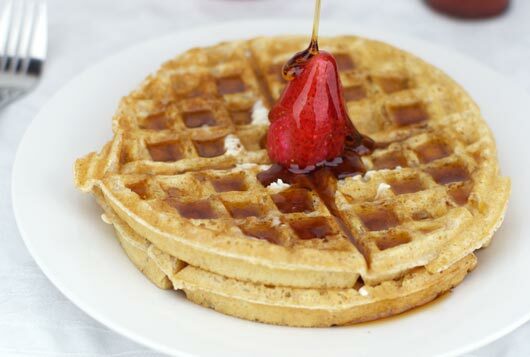 I also added more vanilla for a wonderful taste to the waffles as well as 2 Tablespoons of ground flax. Next time, I will do the canola because I think the recipe will be just as tasty without the butter. 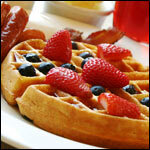 The waffles were a little heavier because of the protein drink, but I was able to get a crisp texture. Very excellent taste! I am so happy with it!